A pre-eminent figure in the real estate industry, Mr. Stevenson is Chairman of the Board of Stevenson Real Estate Services which he founded in 1962. Mr. Stevenson is also Founder and President of Central Investment Company and Founder and President of Stevenson Property Management Company. 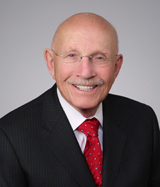 Mr. Stevenson is a Certified Commercial Investment Member (CCIM) Charter Member and has specialized in commercial and investment real estate for the past 45 years. Robert W. Stevenson earned a B.A. degree from Dartmouth College, an MBA from the Tuck School of Business Administration and an M.A. in Psychology from Pepperdine University. Mr. Stevenson is a past President and Director of the Glendale Board of Realtors, and a past Director of the California Association. He is past Chairman of the Board of OneCentral Bank in Glendale. Mr. Stevenson is past President of the Verdugo Club and has served as a member of the Board of Directors of Glendale Memorial Hospital. He is a past President of the Glendale College Foundation; Founder and Vice President of the Glendale Cardio-Vascular Research Institute. Mr. Stevenson is presently serving as Director of Business for the First National Bank.